There was a time when we really didn't know what to make of bacterial systematics. We knew that there were a lot of different species out there (not, it turns out, any near as many as there actually are, but still...) but prior to the molecular revolution of the last few decades we lacked the facilities to tell how many of them were related to each other. Nevertheless, there are some bacterial groupings that are distinctive enough to have been recognised even before the advent of regular genetic sequencing. One such group is the green sulphur bacteria. Culture of Chlorobium phaeobacteroides, from here. Two things must you know of green sulphur bacteria. One, they are (commonly) green. Two, they are associated with sulphur. Like the more familiar blue-green algae, green sulphur bacteria are photosynthetic, using light energy collected by coloured pigments to assimilate carbon dioxide. In some species the photosynthetic pigments are bacteriochlorophyll c or d, giving the cells a grass green coloration. In others, the pigment is bacteriochlorophyll e, and the cells are a chocolate brown. In contrast to blue-green algae, green sulphur bacteria are anaerobic: instead of using water as an electron donor to produce oxygen, they oxidise sulphide or sulphur to produce sulphur or sulphate (a single species, C. ferrooxidans, uses ferrous iron instead of sulphur). As a result, they are found growing in habitats that light reaches but oxygen doesn't. Many species are found in thermally stratified lakes or brackish lagoons with little mixing between upper and lower water layers, and form a distinct planktonic layer at the optimum intersection between light and sulphide gradients. They are also common in sulphur-rich hot springs. The cell's bacteriochlorophylls are concentrated into structures referred to as chlorosomes attached to the cytoplasmic membrane, maximising their ability to gather light at the low intensities. A number of species contain gas vacuoles to improve buoyancy. Most green sulphur bacteria are non-motile, though one species Chloroherpeton thalassium has long, filamentous cells with gliding motility. Molecular phylogenetic analyses have placed this species as the sister taxon to all other described green sulphur bacteria. Scanning electron micrograph of 'Chlorochromatium aggregatum', showing the green sulphur bacteria wrapped around a central (concealed) non-photosynthetic partner. Copyright American Society for Microbiology. An interesting characteristic of many green sulphur bacteria is their propensity for forming close symbiotic relationships with other, non-photosynthetic bacteria. These associations (referred to as consortia) are so closely integrated that many were described as formal bacterial species before their composite nature was realised, and are commonly still referred to by their old 'species' names for convenience (especially as none of the bacteria involved can yet be cultured independently). 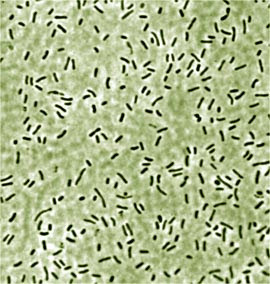 In the majority of consortia, referred to as 'Chlorochromatium' and 'Pelochromatium', the non-motile green sulphur bacteria form a layer around the surface of a larger flagellated, non-photosynthetic bacterium. The motile bacterium is able to swim towards sulphide concentrations that are used for energy by the green sulphur bacteria. The oxidised sulphur or sulphate produced by the sulphur bacteria is then believed to be used by the non-photosynthetic partner for its own metabolic purposes. A slightly different type of consortium, referred to as "Chloroplana vacuolata", grows as non-motile films made up of alternating rows of the green sulphur bacteria and their colourless partners, with the one converting sulphides to sulphur or sulphates and the other converting them back again. Short and long individuals of the non-green, not-always-sulphur bacterium Ignavibacterium album, from here. In 2010, a group of researchers described Ignavibacterium album, currently the closest known non-photosynthetic relative of the green sulphur bacteria, from a sulphide-rich hot spring in Japan (Liu, Frigaard et al. 2012). Unlike the green sulphur bacteria, Ignavibacterium is only a facultative anaerobe, being also capable of growing in the presence of oxygen. It uses a number of electron donors including sulphide (though not elemental sulphur) and also has limited abilities to fix carbon dioxide. However, it cannot use carbon dioxide as its only carbon source in the way that the green sulphur bacteria can; as it lacks the ability to synthesise some vital amino acids, it still depends on being able to obtain those compounds from external sources. When first described, Ignavibacterium was believed to be non-motile; however, further study of its genome has identified complete versions of the genes used in flagella production. It is not unknown for motile bacteria to lose their flagella in the process of being cultured, and its seems likely that this happened to the original Ignavibacterium isolate. A further link between Ignavibacterium and the green sulphur bacteria is provided by an organism that currently goes by the label 'Candidatus Thermochlorobacter aerophilum' (Liu, Klatt et al. 2012). As indicated by the term 'Candidatus', Thermochlorobacter has not been cultured in the laboratory. Instead, it is one of an ever-increasing number of bacterial taxa that have been identified from genetic samples extracted directly from the environment, in this case from hot springs in Yellowstone National Park. Even though these organisms have, in a sense, never been directly 'seen', we can still infer a great deal from their genomic data about what their characters are likely to be. We know that Thermochlorobacter is photosynthetic like the green sulphur bacteria, able to produce chlorosomes containing bacteriochlorophyll (probabably bacteriochlorophyll d) to obtain energy from sunlight. However, unlike the green sulphur bacteria, Thermochlorobacter lacks the ability to meet all its carbon needs by fixing carbon dioxide; like Ignavibacterium, it depends on external sources of nutrients. It is also aerobic rather than anaerobic, and lacks the ability to oxidise sulphides or sulphur. It does resemble the green sulphur bacteria in lacking the ability to produce flagella. Interestingly, however, it retains some genes that are associated in Ignavibacterium with movement towards nutrient sources; as these genes are also present in Chloroherpeton, I find myself wondering if Thermochlorobacter may be capable of gliding motility in the way that Chloroherpeton is. Garrity, G. M., & J. G. Holt. 2001. Phylum BXI. Chlorobi phy. nov. In: Boone, D. R., & R. W. Castenholz (eds) Bergey's Manual of Systematic Bacteriology 2nd ed. vol. 1. The Archaea and the Deeply Branching and Phototrophic Bacteria pp. 601–623. Springer. Liu, Z., N.-U. Frigaard, K. Vogl, T. Iino, M. Ohkuma, J. Overmann & D. A. Bryant. 2012. Complete genome of Ignavibacterium album, a metabolically versatile, flagellated, facultative anaerobe from the phylum Chlorobi. Frontiers in Microbiology 3: 185. doi: 10.3389/fmicb.2012.00185. Liu, Z., C. G. Klatt, M. Ludwig, D. B. Rusch, S. I. Jensen, M. Kühl, D. M. Ward & D. A. Bryant. 2012. ‘Candidatus Thermochlorobacter aerophilum:’ an aerobic chlorophotoheterotrophic member of the phylum Chlorobi defined by metagenomics and metatranscriptomics. ISME Journal 6: 1869–1882. doi:10.1038/ismej.2012.24.